You'll be £14.99 closer to your next £10.00 credit when you purchase If You're Reading This. What's this? 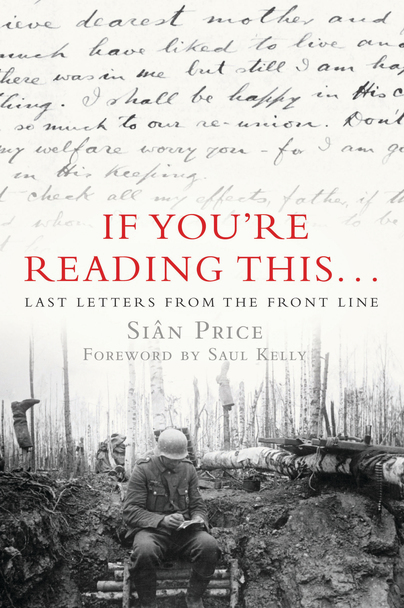 In this profoundly moving collection of 'farewell letters', Siân Price offers a remarkable insight into the hearts and minds of some of the soldiers, sailors and airmen of the past 300 years. Each letter provides an enduring snapshot of an impossible moment – when an individual stares death squarely in the face. Many were written on the eve of a great charge or battle; others were written by soldiers who experienced premonitions of their death, or by kamikaze pilots and condemned prisoners. They write of the grim realities of battle, of daily hardships, of unquestioning patriotism or bitter regrets, of religious fervour or political disillusionment, of unrelenting optimism or sinking morale – but above all, they write of their love for their family and the desire to return to them one day. Be it an epitaph dictated on a Napoleonic battlefield, a staunch, unsentimental letter written by a Victorian officer, or an email from a soldier in modern day Afghanistan, these voices speak eloquently and forcefully of the tragedy of war and answer that fundamental human need to say goodbye. As featured in The Courier. Sian Price...has produced her first book which is a collection of around 60 letters written from soldiers to their loved ones. The letters are from nine different conflicts from the Napoleonic wars to modern wars including the Falkland conflict and Afghanistan. Miss Price, a TV producer, spent three years researching through archives and military diaries to produce the book. Some of the letters were written or dictated as the person lay dying while others have never been sent. If You're Reading This... is a poignant book that brings the harsh life of being in the front line to life, and as a read it makes you think of how easily we forget to thank those men for their service. This is one of the most touching, at times heartbreaking, books I have read in a long time. As seen in Central Fife Times and Advertiser. As seen in the Blackpool Gazette. An insight into the hearts and minds of soldiers over the past 300 years. An aspect of war never fully looked at before, the farewell letter writing by troops is fascinatingly and moving explored by Sian Price. This book is a collection of some of the most moving letters that personnel have penned during times of conflict - from the Napoleonic wars to Iraq and Afghanistan - and reveal the emotional impact that warfare has on both those on the front line and those left at home. Although not all the writers of the farewell letters feature in this book made the ultimate sacrifice, each letter has a poignant tale to tell. This a social commentary which fits in with the training of the modern officer. A broad description of each war into sections in offered. Hence the letters range "from hauntingly and desperately sad to the rip-roaring comedic or angrily polemic'. Some are very articulate. Overall, a worthy examination of a facet of military action whose emotional content I can see appealing more to women as mothers, wives and lovers. To Siân Price, author of If You’re Reading This, the subtle changes in men’s motivation for going to war — from “hearth, home and mother” in the 18th century to “just doing a job” in the 21st — account for much of the changing style and content, over the centuries, of their last letters from the front line: those dread missives written to be opened in the event of their deaths. But, whatever the motivation, whatever the different grim realities of the different wars, one thing that shines out from so many of the letters that Price quotes from, or reproduces in their entirety, is a striking uniformity of sentiment and eloquence across the decades — and, astonishingly, two of the most uniformly poignant of all the letters she includes were written nearly a century and a half apart, in 1861 and 2003. With tales of love and heroism from conflics such as the Napoleonic Wars and Afghanistan today, they were collected by an historian who spent three years reading 30,000 of them. The poignant farewells encapsulate the final words of servicement to their loved ones before they were killed in action. The letters are so redolent of the times in which they were written. Some books linger in your thoughts long after you have finished reading them. This is certainly one of the most moving and emotive books I have ever read. This is a book that deserves the widest readership. In an age when huge demands are placed on the armed forces, often with relatively little return, this book is a timely reminder of the tremendous sacrifices made by fighting men and women of all countries in all ages. The final letter from a Second World War pilot from Chester has been published in a history book. Farewell letters from servicemen who never made it home have been unearthed to form part of a poignant book by historian Sian Price. The never-before-published final notes of seventy soldiers span 300 years, from the Napoleonic Wars to present day conflicts in Iraq and Afghanistan. Expressions of love and the need to say goodbye unite the words from these fallen heroes who hoped their messages would never need to be read. A new book offers a moving insight into the minds of Lancashire soldiers facing fear and hardship in war zones. A tear-jerking book had just been published which includes letters to loved ones from serving members of the armed forces. They are among the most moving testaments of war and provide a compelling insight to a soldier's mind-set as they head into danger. Heart-rendering accounts of war-torn history are revealed in letters penned by a teenage soldier to his mother just hours before he was killed. For author Sian Price is has been an emotional journey, delving into the lives of men who wrote these very personal goodbyes. A new book features poignant letters written to his family just weeks before he was killed on the frontline. A poignant and sometimes heartbreaking book. A Gwent TV producer has published a new book looking back over 300 years of soldiers' farewell letters. Where possible, Miss Price also spoke to the families of fallen soldiers about their reaction to their final letters. The moving final letters home of a Rainow soldier killed in combat feature in a new book. The moving final letters home of two Manchester soldiers killed in combat feature in a new book which captures the true horror of war and offers a glimpse into the mindset of soldiers. An emotional course through farewell letters from the Napoleonic Wars to Afghanistan. Siân Price is an award-winning television and radio producer whose credits include Time Team and Coal House. She has a BA in History from Warwick University and an MA in Film Archiving from the University of East Anglia. This is her first book. The Radio 4 documentary from which the book has grown won a New York World Radio Award for History.